If you’re a regular visitor here – or over at our Facebook page – you know this verse is the basis for what has become a long-running series. 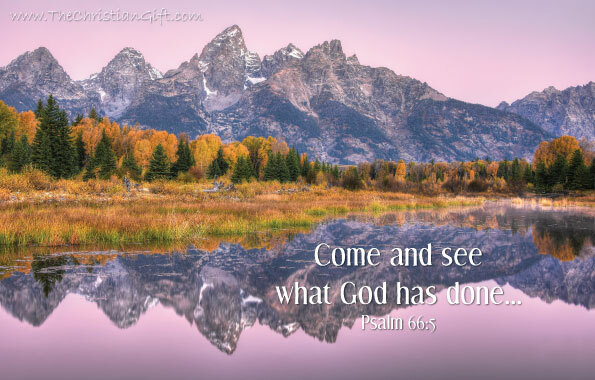 “Come and see” indeed! God has surrounded us with beauty in the natural world. One need not jet off to some exotic destination or go to great lengths to see it. Wonderful imagery can be as close as the other side of your window. It can be as near to you as the park at the center of town. Or up in the sky. I made this image last autumn in Grand Teton National Park. While I’d hoped for some clouds at daybreak to pick up color from the rising sun, there was nothing but clear sky. Still, the twilight wedge put on quite a show on that morning. Landscape photographers often don’t get what we hope for….but sometimes what IS served up is quite special in its own way.